SiteMentrix allows you to create pages and edit the content in them without requiring knowledge with HTML. You write your texts with the online editor of the SiteMentrix Content Management System. SiteMentrix is the easiest way to keep your website up to date. SiteMentrix CMS allows you to make a new page with your browser. 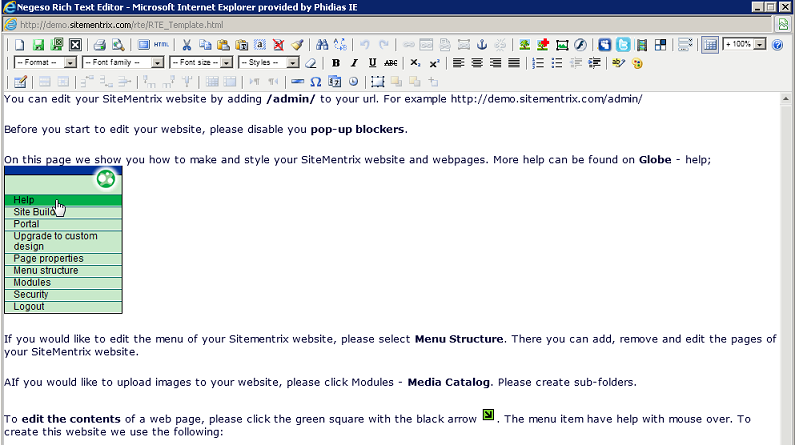 You are not restricted in the use of SiteMentrix, you can create as many pages as you wish. Editing a page is very easy with the SiteMentrix text editor, which can be accessed with your browser. You will be able to write text, add formatting to the text and upload and insert your photos it to your website. No knowledge of HTML or programming is needed. You now have fine grained and complete control over the CSS styling of each element in the pages of your website. You do not need to edit the HTML and CSS style manually anymore (although this feature remains available). 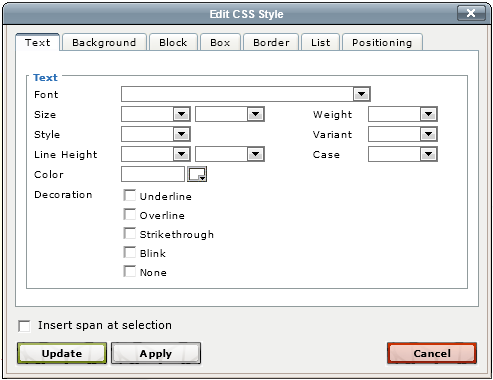 In the CSS style editor, using point-and-click, you can set all relevant CSS style elements. For example, choose a font (type face)from the drop-down listbox. Styling errors caused by typing mistakes are a thing of the past. However, with SiteMentrix you do not need to type in HTML tags, it works like an online word processor. I can create as many webpages as I want. Changing the content of my webpages is very easy to do using the online text processor. SiteMentrix proves that maintaining a website does not have to be complicated. SiteMentrix is very simple to use, yet it is rich with features. Now that is a powerfull combination. As for most busy people, I do not have much time on my hand to keep my website up-to-date. With SiteMentrix, keeping my website up-to-date is easy and requires little time, thanks to the intuitive interface and the online word processor. Create webpages and edit the contents of your website with SiteMentrix CMS without requiring knowledge with HTML.